The EZ-ZONE®RM high-density limit module used in conjunction with the EZ-ZONE RM temperature control module and high-density control module offer agency approved over and under temperature limit function to ensure system safety. 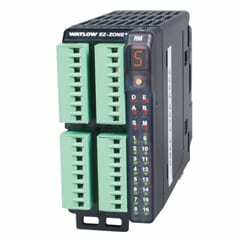 The EZ-ZONE RM high-density limit controls 4, 8, or 12 limit loops per module or up to 192 limit loops per system. Watlow’s microprocessor-based temperature limit controller provides an economical solution for applications requiring temperature limit control. Limits are available in a broad range of packaging options, allowing selection of the best version for an application. The temperature limit controller Series LV is available with an operator interface and can be ordered in 1⁄8 DIN-square panel mount or DIN-rail mount design configurations. The variable SERIES LV temperature limit controller includes an operator interface for viewing and selecting the set point. A red, four-character seven segment LED displays the set point. Set point selection is made with a continuous turn rotary encoder. 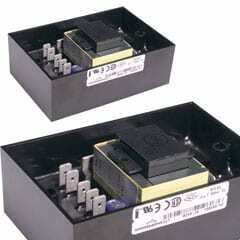 Operating range temperature values are customer defined in the product configuration part number. The temperature limit controllers are factory mutual (FM) approved with special UL® approval for the open board potted versions. 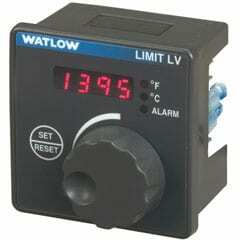 Watlow’s limit controllers include industry leading service and support and are protected by a three-year warranty. 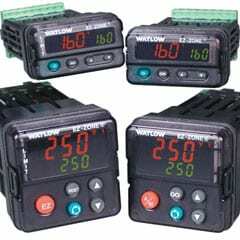 Watlow’s family of micro processor-based temperature limit controllers provide an economical solution for applications requiring temperature limit control. Temperature limit controllers are available in a broad range of packaging options, allowing selection of the best version for an individual application. Temperature limit controllers are available without an operator interface and can be ordered in square 1/8 DIN-panel mount, DIN-rail mount or open board design configurations. 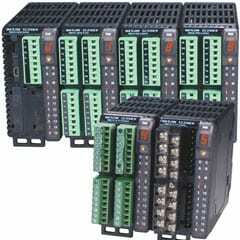 The SERIES LF limit controllers offers fixed set points and can be supplied with or without an operator interface. Operating set point temperature values are customer defined in the product configuration part number. The LF temperature limit controllers are factory mutual (FM) approved with special UL® approval for the open board potted versions. 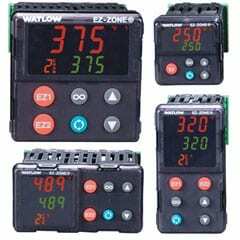 Watlow’s temperature limit controllers include industry leading service and support and are protected by a three-year warranty.